Following on from the great success of my first ‘Dream It & Do It’ event in Ariel House with Nicola Carolan (The Naked Blondie), I am delighted to announce that I am teaming up again with Nicola. This time we have even bigger and better plans. 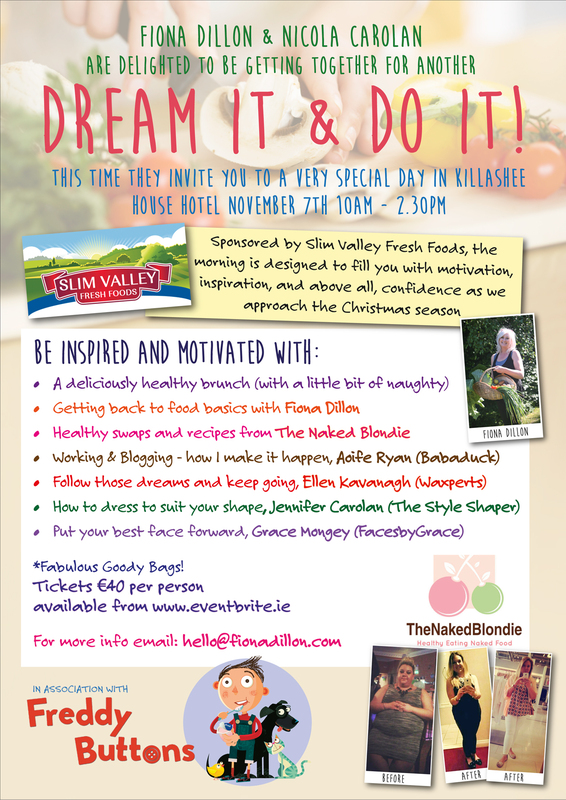 We invite you to join us in Killashee House Hotel on November 7th for a morning of good food, chat, inspiration and motivation. We will have guest speakers with really positive stories to share. Whether you want to lose weight, write a blog, start a business or generally, just feel more positive about life, we have the hints, tips, advice and guidance to get you on the right road. Brunch will give you the opportunity to sample some of the delights of Slim Valley Fresh Foods (and we all know it would be no fun without something a little bit naughty on the plate too…..). One of Ireland’s best-known food bloggers Aoife Ryan (Babaduck), will tell us how she manages to work full time and still have one of the top food blogs in the country. Ellen Kavanagh of Waxperts will share her story of the dream she had and how she made it a reality. As well as the stories, we’ll have advice on how to dress for your shape with The Style Shaper and Grace Mongey (Faces by Grace) will be on hand, not only to tell us about her weight loss story, but to share her top tips as a make-up artist. Of course Nicola and I will be talking too – and there’ll be plenty of time for a Q&A. Then there’s the goody bags. All I can say is that those of you who attended our first event will know that our goody bags, are eh, rather large……! The tickets went on sale yesterday and were sold our within hours, but don’t worry, we have rearranged space at the venue and added some more tickets. « My Boy Freddy Buttons is a Finalist!